Following the announcement by the Minister of National Defence during the summer of 2013 that the Canadian Army would revert to traditional rank nomenclature for certain trades and units, the adoption of Divisions to replace Commands (grouped by regions), and the re-adoption of “Pips and Crowns” for officer ranks, some units were left to redefine their Regimental traditions of dress. Particularly affected were those with distinctive devices such as Guards regiments who traditionally wear the Star of the Order of the Garter rather than the Star of the Order of the Bath, as well as blackened devices for Rifle regiments. Specific regimental patterns were not be supplied by the Crown, and would have to be acquired by the units using their own funds. 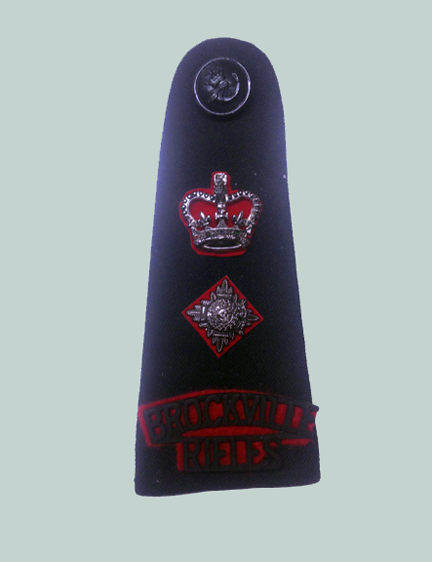 From the period of March to November 2014, The Brockville Rifles undertook discussion on the appropriate pattern to be selected for their officers, remaining in line with its pre-1968 traditions. The regimental museum, curated by Maj (ret’d) Roger Hum, was instrumental in this process, as was the regimental senate who offered advice and opinion on the options available. The regimental museum offered historical examples to the Commanding Officer, LCol M.S. Herron, for review. The first sample, provided as a concept, was a crudely cast copy in the appearance of pewter, and having the improper dimension requirements of 23mm x 23mm. This example, and particularly the definition of “pewter”, became a hurdle to selection in the following weeks. As no Rifle regiment could provide a definition of “pewter” as a description of the device, help was sought from the collector’s market via social media. London, Ontario-based collector, Mr. Michael Reintjes supplied a picture showing stark variations of “pips” worn by the Oxford Rifles during the Second World War, demonstrating the variety of construction, material and level of blackening, or lack thereof. The proposed prototype which was assembled by the Regimental Museum from museum items. The initial samples provided by Penny’s in “shiny gun metal”, of note is the improper Star of the Bath with ‘Ich Dien’ scroll. The CO, fond of samples showing exposed relief initially sought samples from Penny’s Ltd., of Thunder Bay. The first samples were described as “shiny gun metal”. The general consensus of the regimental senate was that the darkened silver was inappropriate and these were removed from further consideration. The second sample from Penny’s in gloss black finish. 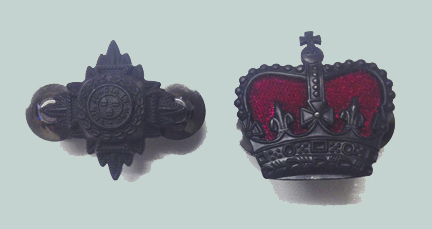 The crown on the left was polished using steel wool to show relief. In the June to August time-frame back and forth correspondence with Penny’s followed. Penny’s, submitted a second sample in gloss black which was of higher quality and displayed finer detail. 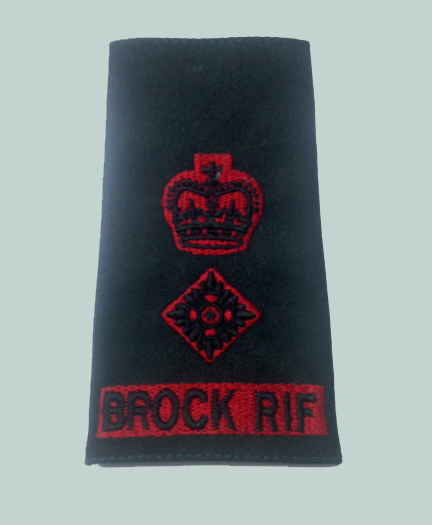 Although these were well made, the red wool backing to be worn in conjunction with the insignia was, in fact, felted paper of poor quality and was rejected in favour of a flat black device which matched the blackened shoulder titles. Additionally, the crown was slightly different in shape and detail to that being issued by Logistik Unicorp. 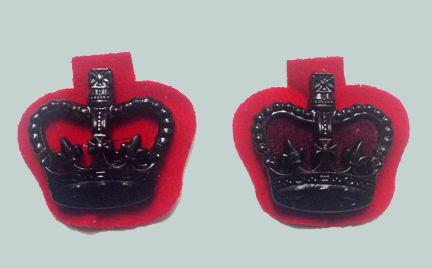 Crowns submitted by Penny’s: on the left from the second sample run, and on the right a third sample run. The background material within the crown was deemed to be too dark, nearing purple. In late August, the Ottawa firm of Guthrie Woods Ltd., was contacted to provide samples. Their crown, being of the same pattern as the issued device, was favoured and the stars exhibited crisp detail. On 18 September 2014, a decision was made by the Commanding Officer to purchase metal devices pips and crowns from Woods. An initial order of 25 pairs of stars and 10 pairs of crowns was placed by the Officer’s Mess. 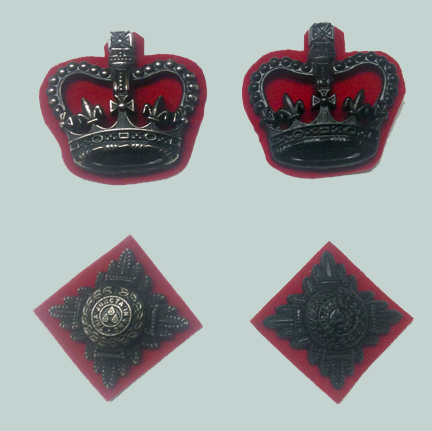 These are to be stocked by the regimental kit shop for officers to purchase, following an initial issue. The decision for cloth slip-ons to be worn on the undress shirt and overcoat was sourced to Penny’s of Thunder Bay. The delivery of these officer’s slip-ons was delivered on October 28th, 2014. The approved, and selected pattern, manufactured by Guthrie Woods. 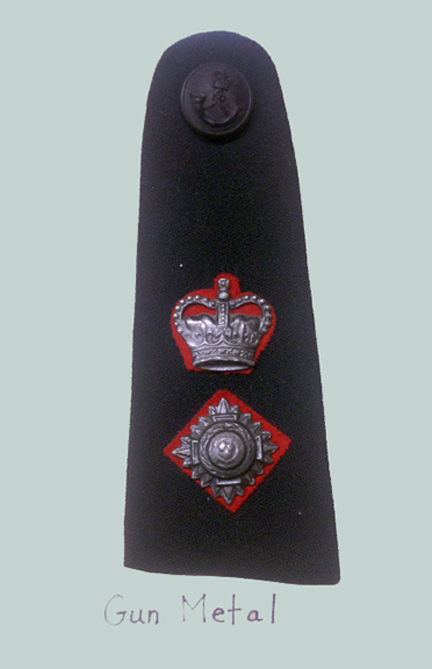 A LCol slip on showing the details of the embroidered crown, star and unit title in black over red. A nice foray into recent history. I’ve always thought traditional rifle regiment kit was really, really sharp. Brilliant. Thank you for this fantastic piece of “history as it happens”, for my archives.